This is the twelfth and final article of our Living Tabernacles series, where we study the Tabernacle in depth. It is exciting to see how each element symbolizes some characteristic of Yeshua. It is also challenging when we examine what each element means for us, since each of us is now a living tabernacle of YHVH [Yehovah]. YHVH is building His kingdom on earth as it is in heaven. Our King reigns from His throne and also pronounces judgment from there. The last article focused on the Bronze Laver that was used by the priests for cleansing themselves. We also talked about us as His kingdom of priests today, still needing to cleanse ourselves by the “water of the Word”. We recalled that the Word is both the written Word in YHVH’s Scriptures as well as the living Word in the person of Yeshua our Savior. In this article, I want to expand on these concepts, looking both backward and forward into the various ways that YHVH wants us to come into His presence. Before we leave the Tabernacle, though, it is important to know the meaning of the Hebrew word for Tabernacle, Mish’kan. The root of this word is shakan, which means presence. Combined with the prefix “M”, Mish’kan means “In His Presence”. We know from Scripture (Exodus 40:33-38) that the “cloud of His presence settled on it and the presence of YHVH filled the Tabernacle”. When we go forward from the Tabernacle, we see that Solomon’s Temple included the Bronze Laver (see 1 Kings 7:23-30). This “laver”, however, was so large it was referred to as the bronze (or molten) sea. It was about 8’ high and 15’ across, and was supported by 12 statues of bulls around the outside. To enhance its lavish appearance, 10 wheeled bronze laver carts surrounded the structure, each very ornate, with images of lions, oxen and cherubim carved into the side panels. The decadence of this bronze laver was not specified in the original Temple plans that YHVH gave to David, but we can only assume that Solomon wanted each of the implements to be grand and larger than life to further glorify YHVH. On the spiritual level the grandeur of Solomon’s laver emphasizes our need to cleanse ourselves before coming into the presence of YHVH. The awesome presence of YHVH in the glory cloud was constantly over the Ark of the Covenant in the Holy of Holies within the Temple. While Solomon’s Temple and all its implements are amazing, we learn even more about YHVH’s original desire to meet with us when we go back before the time of the Tabernacle. Before the Tabernacle, we see that Moshe originally met with YHVH in the Tent of Meeting out in the desert (Exodus 33:7-11). He had to construct this tent outside of the camp because of the idolatry (golden calf) of the Israelites at the foot of Mt Sinai. In Hebrew, this tent was called the Ohel Mo’ed, which literally means the appointed tent to meet with YHVH, or the tent of His presence. Before Moshe and the Israelites built the Tabernacle, YHVH had said to Moshe that His presence would not go with them when they went up into the land, because if He did He would surely destroy them (Ex 33:5). At this point, the people grieved deeply and repented for their sins. So, whenever Moshe set up the Tent of Meeting, YHVH’s glory cloud would come down and rest on top of it, and the people fell down prostrate at their tents and worship the glory of YHVH (Ex 33:8-10). In YHVH’s infinite mercy, He allowed anyone who was willing to come out to the Ohel Mo’ed and share in His glorious presence with Moshe. 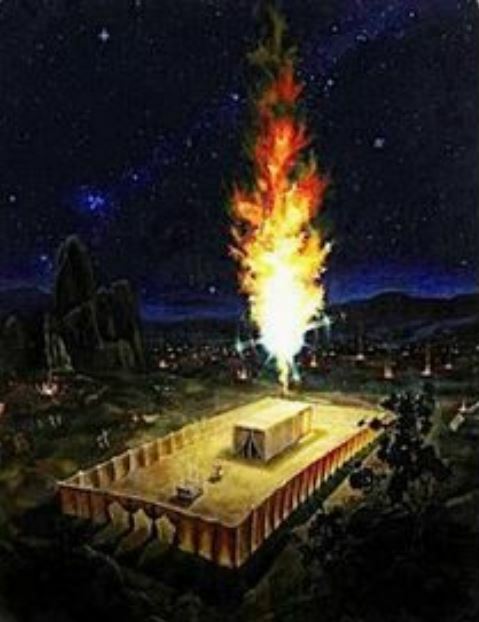 When I compare this to the glory of the Tabernacle or even the Temple, I would prefer to be face-to-face with YHVH’s glory at the Ohel Mo’ed any day of the week – this was an opportunity to meet with the Creator of the universe one-on-one – wow! Moshe was a prototype of Messiah Yeshua when He opened the way for the people to return to YHVH’s presence. Just as Moshe set up the Ohel Mo’ed and opened the “tent-flap” so that He and others could meet with YHVH, Yeshua has torn the veil and opened the way for us to enter the Holy of Holies and meet with YHVH face-to-face. It would have been enough (dayeinu) for Yeshua to die for us, but then He sent us YHVH’s Holy Spirit (Ruach HaKodesh) who now lives inside of us, as we are now the Tabernacles for His presence to be with us always. Finally, since we are YHVH’s kingdom of priests, He has supplied us with everything we need to minister to Him. He has given us His whole armor to protect us from the fiery darts of the enemy, and the sword of the Spirit, which is His Word, living and powerful and sharper than any two-edged sword. We now have the privilege to meet with YHVH in any time and place – we are His Tabernacle [Mish’kan], and we carry His presence with us at all times. Let’s give Him our praise at all times, spend time with Him, get into His Word and use it for His glory – Amen!